Formerly in red velvet, with gilt edges and gauffered; rebound in 1947 in full purple morocco by Marguerite Duprez Lahey. Purchased by Bertram, 4th Earl of Ashburnham from Samuel Woodburn on apr. 23, 1844; Earl of Ashburnham Collection (appendix, 1861, p. 102, no. 43); sold in 1897 by H. Yates Thompson (catalogue, 1902, II, p. 125-130, no. 69); his sale (London, Sotheby's, June 3, 1919, lot 1) to Quaritch for J.P. Morgan (1867-1943). 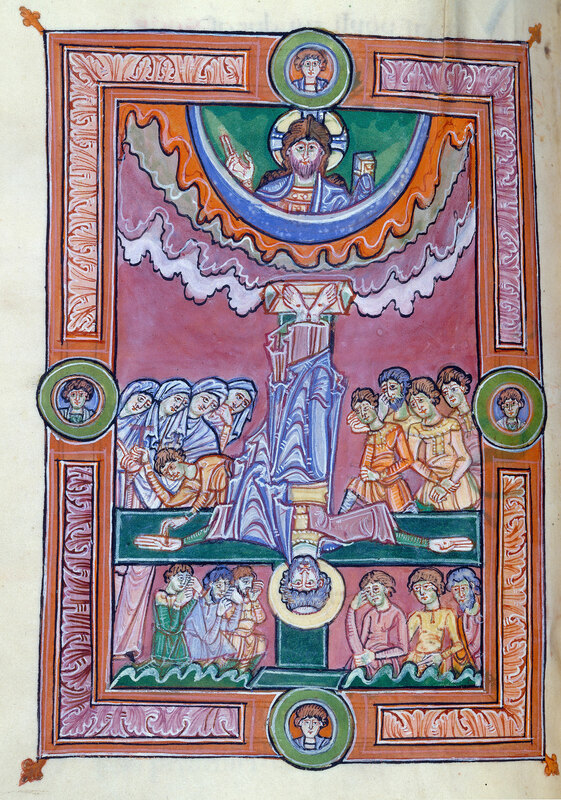 Ms. sacramentary, for the Roman rite in a Benedictine monastery; written and illuminated at Mont-Saint-Michel Abbey, in Normandy, ca. 1060. Forty-five leaves from this manuscript are held in the Bibliothèque municipale in Rouen (MS 116). Musical notation: primitive neume notation of northern France throughout the manuscript. Decoration: 12 full-page miniatures and decorative panels; 4 half-page miniatures; 11 panels with decorative initials, 7 smaller historiated initials. The Abbey of Mont-Saint-Michel rose in importance during the Norman Conquest. In the eleventh century, when the abbey was built on the rock, its scriptorium pioneered a Romanesque style. As a pilgrimage site between England and the Continent, the abbey absorbed influences from both regions and disseminated its distinctive style. This Sacramentary, containing texts read by the celebrant during high Mass, is the most lavish manuscript from Mont-Saint-Michel. This Crucifixion of St. Peter is executed in the characteristic Norman style, with figures more drawn than painted. The busy drapery and foliage, jagged lines, and distinctive pale palette betray the influence of tenth- and early-eleventh-century English decoration.